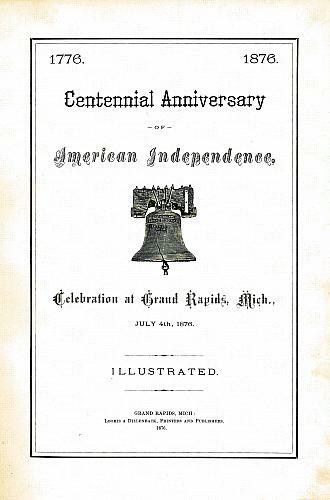 The 1876 American Centennial was cause for celebration across the United States. The year marked the one-hundred anniversary of America’s declaration of independence from Great Britain. Grand Rapids, like many cities around the country, created a spectacular celebration to commemorate the historic occasion. Not only did residents have the Centennial Celebration to look forward to in 1876 but, coincidentally, that same year marked the 50th anniversary of the founding of the city. The Mayor created a special Centennial Planning Committee to organize the event. The committee handled the city's decorations, organized entertainment and solicited community support. The result was a three day affair that featured parades, live entertainment and of course fireworks. In anticipation of large gatherings, the Police Department offered the following precautionary note: "There will be the unusual number of roughs, rowdies, house-thieves and three-card Monte-men" so exercise care around your houses, "keep an eye and hand upon your pocket . . . and steer clear of doubtful side shows." Aside from a few overly enthusiastic individuals with fireworks and pistols the police had few reported incidences. On July 1st the Daily Eagle reported that some of the most disastrous fires in the nation had occurred on the Fourth of July. As a result, the Fire Department issued public warnings urging citizens to take the threat of fire seriously. Certainly Grand Rapids had not forgotten the disastrous fire of 1873 that destroyed much of the northeastern side leaving "one hundred-thirty families homeless and a number of mills destroyed." The Committee on Decorations erected decorations in and around Campau Square. The center piece was a large arch, 64 feet wide, 70 feet in height, and modeled after the Arch of Constantine at Rome. At 10 am on the Fourth many people gathered in and around Campau Square to watch the grand procession weave its way through the streets. In all, forty-one groups and organizations joined the procession. A reputed 40,000 people attended the three day spectacular that included a fireworks display, at a cost of $1000, and other amusements which concluded the day. There were also smaller arches placed on Monroe, Canal and Bridge Streets that were decorated with patriotic mottos, evergreens, and flags. Any resident that wished to decorate their home or business was invited to purchase evergreen from the city at a reasonable rate. 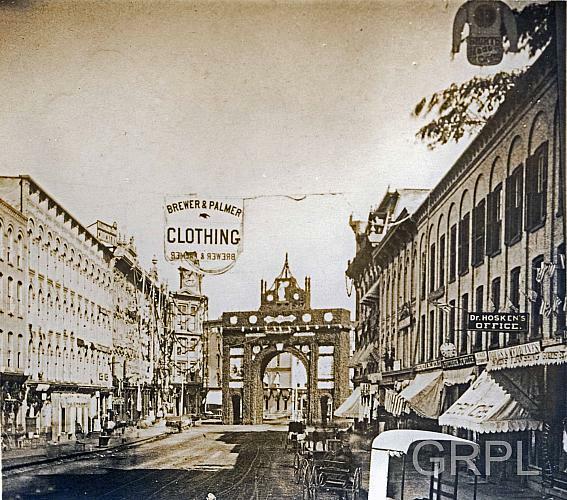 The triumphal arches and principal buildings decorated near Campau Square were photographed and published in several pamphlets and sent to newspapers in New York City. Newspapers ran front page articles announcing the scheduled program for the Centennial celebration. The city also printed and hung posters throughout the city and. The program highlighted the three days of festivities which included parades, fireworks, a special oration at the park, and a circus. Residents and visitors entertained themselves at venues of all sorts during the Centennial Celebration. On the afternoon of the Fourth a parade by the always comical Horribles, a revival of the old "crew" of 1861, entertained spectators. The Horribles were part of a secret society not necessarily original to Grand Rapids. One witness noted the procession of the Horribles was "an old time affair like Carnival with floats, music, and folks disguised in costumes." Their ambulance wagon, about two feet long and eighteen inches high, drawn by two full sized elephants from Forepaugh's circus, was a decided sensation. The manager of Forepaugh's Circus that was in town for the Fourth of July was so impressed with the display that he offered the group $10,000 to join his troupe; they respectfully decline the offer. 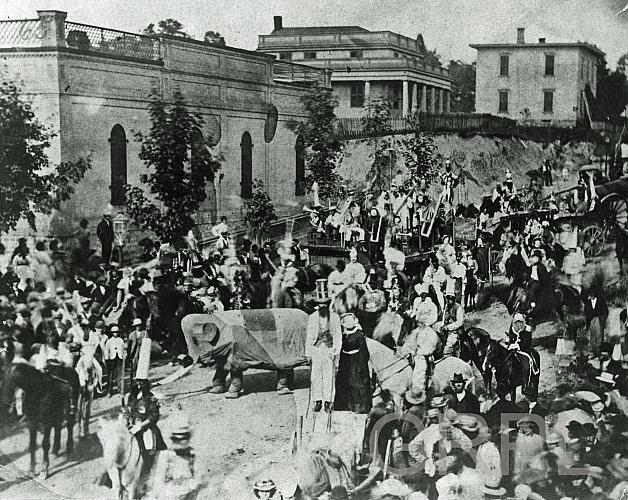 Thousands of people walked the distance to the west side of the Grand River where they were entertained by Forepaugh's Circus, which offered shows under eight different tents. Guests were treated to jaw dropping performances featuring gymnasts on horseback, limber trapeze artists and tumblers, and trained elephants that balanced on pedestals to form a pyramid. Children and adults alike marveled at rare animals which included rhinoceros, camels, tigers, leopards, zebras, sea lions, and even a polar bear. Local businesses took advantage of the Centennial to promote their own products and services. In 1876 one disgruntled Grand Rapidian noted "there must be a limit to all things and sooner or later people must stop everything Centennial. One can hardly go a hundred feet along Monroe or Canal streets without seeing a dozen articles senselessly labeled Centennial." The Centennial event was a celebration of our nation's independence but it was also a time for Grand Rapids to come together to celebrate their community. The city warmly opened itself to outsiders, embracing visitors from near and far. 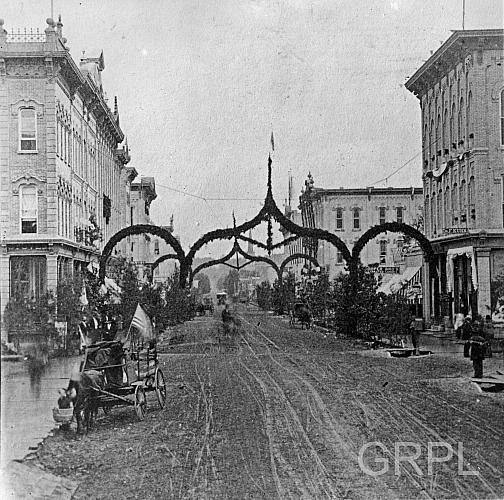 The Centennial did more than bolster the spirits of Grand Rapidians; it left a lasting impression upon all those who had witnessed the grandest celebration the city had ever known. Fitch, Geo. 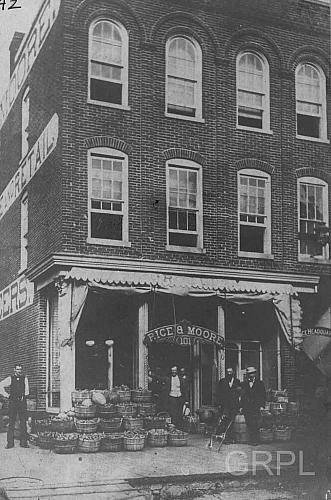 E.. Old Grand Rapids: A Picture History of Old Conditions. Grand Rapids, MI : Grand Rapids Historical Society, 1986. Grand Rapids Daily Eagle. October 1875 through July 1876. Grand Rapids Daily Morning Times. April through July 1876. Grand Rapids Public Library Photo Collection. Collection 54, Box 6, Folder 4. Grand Rapids Public Library George E. Fitch Collection. Collection 66, Box 1, Folder 3. Grand Rapids Saturday Evening Post. June through July 1876. Grand Rapids Weekly Democrat. May through June 1876. Louwerse, Cornelius. Story of My Childhood in Grand Rapids. Collection 263, Box 4. 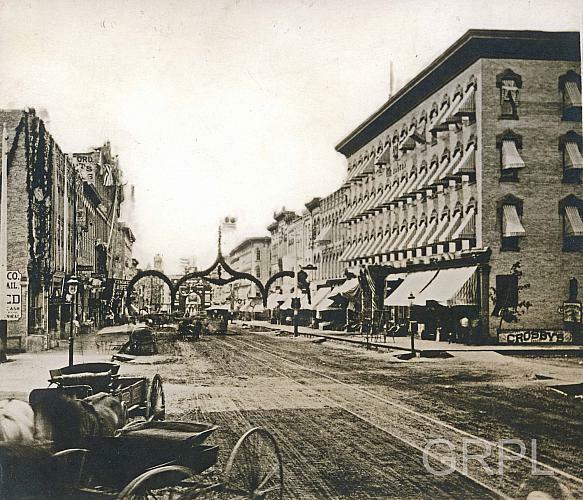 Lydens, Z.Z.. A Look at Early Grand Rapids. Grand Rapids, MI: Kregel Publications, 1976. Mapes, Lynn, and Travis, Anthony. 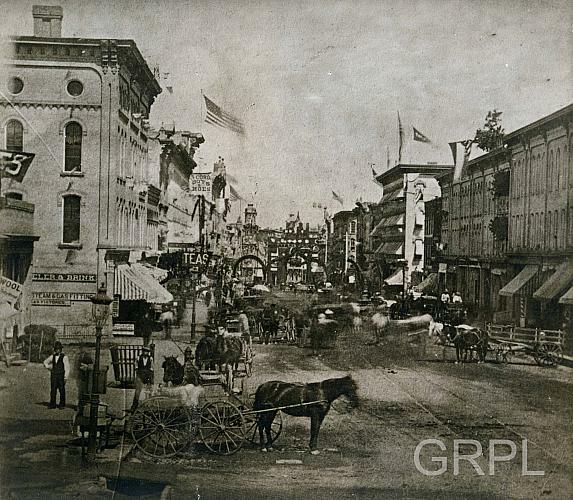 A Pictorial History of Grand Rapids. Grand Rapids, MI: Kregel Publications, 1981.